Youth substance abuse affects families in many ways and often times plays a factor in a young person’s decision to run away, whether the abuse is that of a family member or a youth’s own abuse issues. According to a 2015 SAMHSA study, approximately 2.2 million adolescents, aged 12 to 17, and 7.8 million young adults, aged 18 to 25, were currently using illicit drugs. It also showed that 2.4 million adolescents (12-17) and 20.4 million young adults (18-25) had used alcohol within the past month. While alcohol and drug use can be a cause of a runaway incident, it can also be a method of coping with the challenges of being on the street. Module 11: Drugs & Alcohol asks participants to think about the everyday messages they receive regarding substances, why people use drugs and alcohol, and the effects and risks associated with alcohol and drug use. 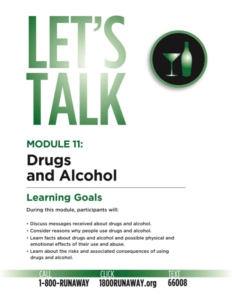 Module 11 engages participants in hands-on activities and aims to equip young people with the knowledge about drugs and alcohol so they can make better-informed decisions when presented with these issues. Youth gather information about drugs and alcohol from a variety of sources, and this information may not always be accurate. In the first two activities youth get a chance to talk about messages they see in the media regarding alcohol and drugs, as well as learn correct information about different substances and the effect they can have on someone’s body. It’s amazing the types of messages youth are getting every day in music, movies, and on television. While some media may show the adverse effects of addiction, many promote the use of alcohol, tobacco, and other drugs. During a “grab bag” game, youth will learn more about these substances they may hear about so often, but don’t really know the effects they cause. It’s important for youth to have accurate information about alcohol and drugs in order to make healthy choices. Decisions are made every day. Some may have bigger consequences for better or worse. The last two activities really focus on the effects alcohol and drugs can have on a person and the consequences that can come from substance use. The “Swivel Game” gives youth a chance to experience the physical effects drugs and alcohol can cause. The “Risky Decisions” activity allows youth to think about how decisions can lead to consequences, both good and bad. It’s important to remember that consequences affect not only the person using drugs or alcohol but also others, including family and friends. Drugs and alcohol make it difficult to make healthy choices. Without the ability to make healthy decisions, a person becomes susceptible to negative consequences that s/he has to live with for a long time. It’s important for facilitators to recognize that there are youth who may already be having substance abuse issues or have friends/family that are having issues. Youth don’t have to be considered “at-risk” to be exposed to substance use either. It’s in their schools, neighborhoods, and social events. Drug and alcohol issues can affect anyone, no matter their situation or background. The goal is to give youth a safe place to talk, ask questions and voice concerns about alcohol and drug use so they are better able to make healthy and informed decisions in their own lives.